Easter holidays have passed, the only ones that have kept us anchored in the spring passed, May 1st vacation, so we can say that we get in the middle of summer. In addition to classic grilled or outings, you can start preparing for the big summer holidays. You can start planning destinations, places to visit and you have to decide if you want to spend your summer holidays at sea, mountain or somewhere more exotic. Depending on the person, whether with family, kids or without, everyone will choose what is most reliable for his wallet. Even if you think that a great stay at the seaside is cheaper, I assure you that five nights outside the country are not much more expensive. Therefore, we present five places that you can visit in summer, five story places where you can spend your vacation. Some of them have resounance name and others, even if you have not heard of them, I assure you they are great both in terms of tourism, and qualitative in terms of location. All five destinations have something special and have a delightful relief. 1. 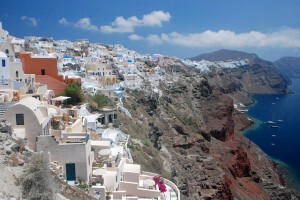 Santorini – Many of you will want to go somewhere to sea, so you can enjoy full the sea and sun in Santorini. This island is actually called Thera is in the southern Aegean Sea at a distance of about 200 Km from coast of Greece. The area is superb with a specific cliffs and the view it offers at sunrise and sunset are truly special place. The architecture is typical, white houses whose roofs made of colorful rock strong Mediterranean sun shine. In this resort you can do what you want and what you usually do at sea, beach, sports beach, you can explore the surrounding smaller islands, you can do snorkeling and hiking. Santorini is part of UNESCO and is a tropical paradise. 2. Dubrovnik – Maybe not as popular as Greece, Croatia has an absolutely wonderful seaside resorts rank with European and architecture specific. Dubrovnik is the most famous tourist destination on the Adriatic coast. But Dubrovnik is more than just a seaside resort, is a great tourist destination, a major port and one of the largest cultural centers of Croatia, located in the region of Dalmatia. Here, in addition to traditional beach activities, you can visit museums, try local cuisine and understanding of Croatia as a country. If you have already visited Dubrovnik, can choose, still in Croatia, another interesting area – Peninsula Rijeka (where you can make a trip to Venice). 3. Kotor – Places to visit – Bay of Kotor going a little south of Croatia, I recommend another destination that has potential and in a few years will become one of the great European tourist areas in summer. Kotor is a coastal town in Montenegro and is situated in a more secluded area of the bay of the same name. The city was one of the major ports of the Mediterranean. The location is superb for visiting museums and ancient fortifications of the period in which the area was under Venetian administration. The currency used is the Euro so no need to make exchanges in other currencies. Apart Kotor choose from, all in Montenegro, Budva Riviera area or town Herceg Novi where you can make a brief visit to Dubrovnik or a boat trip to the Blue Cave where you haave the impression you bath in ink. 4. Venice – This tourist location no longer needs introduction. Venice itself is a city on the water and open air museum. Even if all prices increase with summer holiday season and high touristic season, it deserves to be caught in time and finances to visit this gorgeous Italian city that has a specific characteristic. For a long time Venice was one of the richest states which govern by itself. The area is perfect for relaxing, visiting museums, ride the gondola and photography. Those who went to Venice do not understand that the beauty of the place lies in the architectural details that were enshrined on walls. Piazza San Marco is superb and there find, in addition to the Basilica of San Marco, the Doge’s Palace and Cafe Florian, the oldest café in operation – opened on December 29, 1720 ( great care at prices ). 5. Zurich – Zurich is the largest city in Switzerland and capital of the district of Zurich. Located in the heart of Switzerland to the northeast tip of the glacial lake of the same name, Zurich is attested from the 15th century BC. the Romans called it Turicum. The place is gorgeous mountain scenery that is all around. The city is calm, lure of wealth and Swiss quality. From here you are not far from the more famous resorts in the Alps and in the summer, you can enjoy a swim in Lake Zurich. When you pack your bags for the holidays do not forget to put the camera, be it a compact or a bridge, or a mirrorless or DSLR – because, over the years, photos of vacation will turn into memories. I wanted to use personal photos to illustrate this article, but a few years ago my hard drive died and I lost a good part of the holidays photos (great attention to where and how to archive your photos).